Letter, George Washington to Benjamin Tallmadge, 1779. Spies do exist in the archive! The Three Village Historical Society hosted a sold out lecture and viewing of Special Collections‘ 1779 George Washington, Culper Spy Ring letter at the Neighborhood House in Setauket on Monday, July 16. Significant to regional and national historical narratives, the letter documents espionage activities in the Three Village Area during the American Revolution. Following a spirited introduction by Assemblyman Steven Englebright, Kristen Nyitray, Director of Special Collections and University Archivist discussed the acquisition and context of the letters (1779 and 1780), their conservation, related outreach programming, and the impact of the letters on the community and beyond. 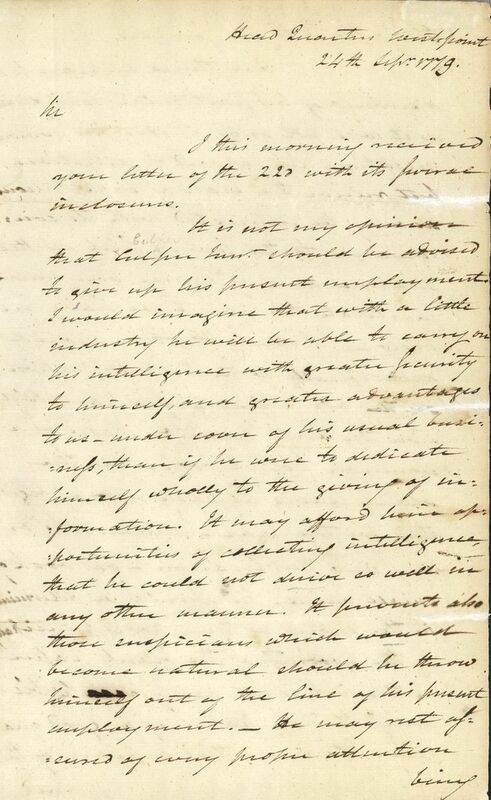 The lecture titled “Matters of Business to his Friend at Satuket” (sic) is a phrase from Washington’s September 24, 1779 letter that reveals his reliance on intelligence gathered by the Culper Spy Ring. 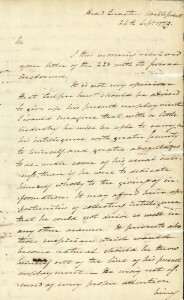 Written to Major Benjamin Tallmadge from West Point, NY, it includes a lengthy discussion on how to manage the key agent Culper Jr. (Robert Townsend), the mechanics of espionage, and methods for transmitting intelligence. Copies of the letters and transcriptions were made available to attendees courtesy of Special Collections. After a lively question and answer session, all were welcome to view the letter up close and to take photographs. For more information about the George Washington spy letters at Special Collections, please visit the research guide for them.